The Bonsai Bulldogge’s head is broad and square, moderately sunken between the eyes (medial furrow). The circumference of the head should be equal to or greater than the dog's height at the shoulder. A narrow head or one that appears too small for the body is a fault. Rose ears set well on the sides of the head are preferred. Button ears are acceptable, as long they are small, not "hound like." Tulip ears are also acceptable, but not preferred. Full pricked ears that stand up on top of the head or cropped ears are considered a fault. The eyes are wide apart and of moderate size. Any color is acceptable. Misshapen or bugged eyes are a serious fault. Pigment around the eyes is preferred. Crossed eyes or non-symmetrically shaped eyes are disqualifying faults. The nose is broad and black; the tip of the nose should lie slightly higher than the root of the muzzle. The muzzle is broad, deep and short with mild to moderate wrinkling. The bite is undershot with the bottom jaw turning up noticeably. Lower canines should not protrude. Muzzle too long (more than 2 inches), a scissor bite, even bite or wry jaws are disqualifying faults. Muzzle should be no shorter than 1 inch. 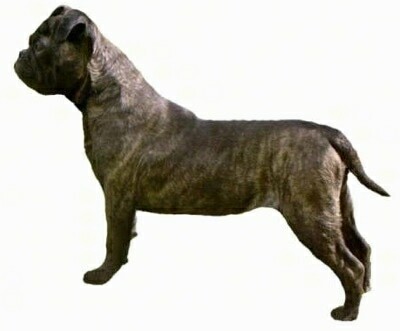 The neck is medium in length and very muscular, flowing into the shoulders and should not be set on the dog so it appears to stop at the shoulders. Ribs should be well sprung (rounded) and the chest wide and deep. Depth of chest should be at least to the elbows. A hollow or narrow chest (slab sided) should be considered a serious fault. Males should appear square and balanced. Females should appear similar with consideration given for body length. A short to medium length back with gentle slope down from the shoulders rising again at the rump is preferred. A level back is acceptable as long as the tail does not come straight off the top of the back. Shoulders should be well laid back with significant angulation to allow for good movement. Straight shoulders are a fault. Forelegs should be straight and wide apart, neither bowing out nor turning in. There should be significant bone substance. Elbows should be relatively close to the body. The lack of bone and substance are very undesirable. Elbows that are loose or "fiddle fronts" are a disqualifying fault. "East / West" forelegs are a serious fault. Rear legs should exhibit significant bend of stifle so to allow for good movement. They should be well muscled. Straight or "posty" rear legs are a serious fault. Cow hocks are a disqualifying fault. The feet are round, tight both front and rear, and the pasterns should be strong. Weak pasterns and/or splayed feet are disqualifying faults. Any color is acceptable with no preference for one over another. The coat is short. A wavy coat or a long coat is a disqualifying fault. There should be no signs of feathering on the legs or neck area; also a disqualifying fault. The tail can be screwed short; docked tails are most common but a pump handle tail that naturally reaches the hock is desirable. The pump handle tail should be carried low and not over the back of the dog. The Bonsai Bulldogge should have the bulldog’s tenacity and is generally not aware of its small size when interacting with other dogs. It is just as loyal and courageous as the larger version, but physically takes up less space, making him very suitable for apartment dwelling. With a very stable temperament and its unwavering loyalty, this breed makes a great watchdog. It is great with kids, cats and other pets when socialized properly. The Bonsai Bulldogge has a jaunty personality and is much heartier than other breeds of his size, making him an ideal family pet. Make sure you are your dog’s firm, confident, consistent pack leader providing rules the dog must follow, and placing limits to what the dog can and cannot do along with proper human to dog communication. Daily walks are also essential to keeping a happy, stable dog. Being a smaller sized dog, the Bonsai Bull is suited to city or country living. Its small size makes it an ideal apartment dweller when properly exercised. A good brisk walk or a quick romp in the park will keep these guys fit. With such a short coat, grooming needs are minimal. An occasional bath, brushing and wrinkle cleaning is all it takes to maintain a healthy look. Bonsai Bulldogges are strong dogs with short straight legs. They enjoy energetic games and will keep in better health if given regular exercise. This breed should be taken on daily walks. They also enjoy a romp in the park. The short coat provides little protection from the elements, making it unsuitable for outdoor living. When going outside in temperatures below freezing, the Bonsai will require a coat for longer outings. To properly maintain your Bonsai Bulldogge’s health and appearance, it is best to have it on a human grade, natural and homemade pet food diet. The Bonsai Bulldogge is being created by Laura Kelsch of Hammerhead & Tie Lang Tou Kennels to appease the people who wish to be able to keep a dog small in size, without lacking in looks or personality.